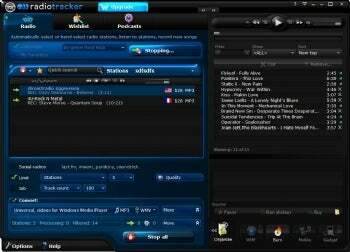 Radiotracker Free (free, but limited) is one of a number of apps that scan publicly available Internet radio stations, rip the tracks from them, and save them as MP3s. It works leagues better than competitor iGetMusic ($40). First, it's not restricted to two Internet radio stations as iGetMusic is, but instead has access to thousands. Second, instead of having to settle for low-quality music, audiophiles can restrict stations by bitrate, meaning Radiotracker will only scan for high-quality recordings, the same quality as individual tracks you'd buy from iTunes or Amazon MP3. Third, it requires no dubious browser security modification to work--just an install of the app and a couple of network drivers that install automatically with it. Radiotracker Free can record from just a few stations at once, or from many up to your available bandwidth. If you're worried about partial songs, tracks that fade out too soon, and so on, Radiotracker Free has that covered. Simply set the appropriate options and it will go after only complete, unblemished music. The Platinum paid version even has wishlists for recording specific artists and even seeking out specific tracks (though the middle-tier Premium version is missing this feature). It seems this app has thought of everything. This may not seem legal at first glance, but developer Audials has posted extensive quotes from the DMCA that support its position: The app doesn't decrypt in any way, but simply records from unencrypted sources, similar to how a VCR works on television. Therefore, Radiotracker is the app of choice for those who want to amass a massive collection of music files inexpensively and quickly. Audials has clearly done the research and seems like a reputable company, so its apps gain credibility. However, this and Audials' other free apps are simply glorified demos; you'll want to spring for the full versions to have any proper functionality at all.